Sam Spinner is the odds-on favourite to win the Stayers' Hurdle 2018 at the Cheltenham Festival, normally backable at 7/2 to score, Wanna get a bigger price? Ladbrokes is offering an enhanced 50/1 Sam Spinner to win! Plus, you will get £5 free bet if your first bet loses! SAM SPINNER has done nothing but improve all season and was a good winner of the JLT Reve De Sivola Long Walk Hurdle when last seen. He saw off some talented horses that day including L’Ami Serge and Unowhatimeanharry for his first Grade 1 win. Claim this insane enhanced price in less than 2 minutes, you are just three steps away..
Join Ladbrokes via our special links and claim 50/1 for Sam Spinner to win the Stayers' Hurdle! 4) If Sam Spinner scores, your account will be credited with extra winning to make payout equivalent to price boost within 24 hours. 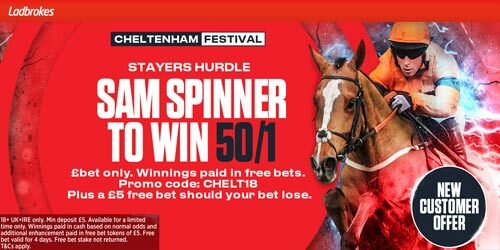 Ladbrokes offer 50/1 Sam Spinner to win the Supreme Novices at Cheltenham + £5 if you lose! His normal odds is around 7/2, but you can claim 50/1 with this offer! New customers only from United Kingdom and Ireland. 18+. "Ladbrokes offer 50/1 Sam Spinner to win the Stayers Hurdle 2018 at Cheltenham"